On your special day you want a hairstyle that makes you feel beautiful and comfortable. And, ideally, you don’t want the style to cost more than the wedding dress or take hours to do. The perfect solution for beautiful hair on your big day is an easy wedding style you can do yourself. When working with shorter hair lengths an elaborate up do may not be possible but you can still enjoy a dramatic style for your special day. For a simple yet elegant style try sleeking your locks back with a shine enhancing spray product and then accenting your look with jewels. Pin on or adhesive backed hair jewels are available in many sizes, colours, and styles. When added along a part, or strung out along one side above the ear these pieces add depth without overpowering short styles. Another simple way to add drama to short hair styles is with elaborate headbands. Pre-shaped bands, or simple cloth tie-ons, can be placed over curly, wavy, or slicked back styles to add drama and flare. Lace, flowers, jewels, and other decorations can also be added to the bands to dress up the style or add more elegance. Finally, if you have short locks but are really in love with the idea of an up do for your big day, you can master the “Faux Up Do”. This style gives shorter hair the illusion of being swept up but only requires about three to five inches in length. To do, flip hair upside down and separate into small sections with your finger tips. Tie each section in a knot with the ends fanning upward from the nape of the neck towards the crown. Secure each “knot” with a bobby pin. After all of the knots are tied tilt your head upright again and use your fingers to fan the ends of the hair strands to create fullness and the look of a sweeping up do. Once the look is just the way you want it spray hair with a medium hold hair spray to lock in the look. Sophisticated and special wedding hairstyles are easier and more varied for longer hair styles. However, the traditional up do is still a favourite among brides. To get the elegant look of a sweeping up do but enjoy the look of a more updated style try one of the following ideas. Starting with hair that has not been washed in at least 24 hours (this makes the strands less slick to work with) apply a straightening balm or mousse for added sleekness, hold, and shine. Then flip hair over and gather the strands in a single pony tail at the top of the crown. Secure with an elastic band in a colour close to or matching your hair colour. Next, separate a section of hair about ½ inch in thickness starting at the outside perimeter of the pony tail. Stretch these strands out and up away from the scalp. Using a bobby pin secure the strand to your scalp near the base of the pony tail about halfway up the hair section forming a loop with a “tail”. Holding the “tail” section, twist the strand a few times and forming an open loop secure the “tail” with another bobby pin. Continue until all sections have been looped and secured. To hold the styles spray the hair with a good holding spray. Starting again with unwashed hair, use a comb to separate your hair into six to eight equal sized sections. 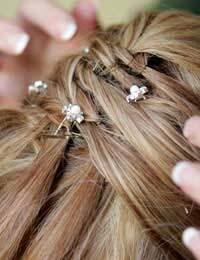 Twist each section into a tight knot and secure with a few bobby pins. Use a hair dryer to completely dry the knots and all strands of hair. Allow the style to dry for at least thirty minutes before undoing the pins or clips. Once hair is loose finger comb it into a pony tail at the crown slightly towards the back of the scalp. Twist the hair into a loose bun and secure with a few pins. Gently pull some strands completely out of the bun while only pulling other strands half way. Experiment with how much hair you pull loose until you get a look you like. Once the style is perfect spray it with firm hold hairspray to lock in the look. Separate hair into two sections, one of hair from the crown forward and one with hair from the crown back. Next, put each section in a pony tail as close together as possible at the back of your head, halfway between your crown and the nape of your neck. Wrap the hair from each pony tail around itself forming a loose, messy bun. Pull strands out from each bun until you get a soft, wavy, wispy look. To complete the look make sure that some strands are let loose around your face. To add a bit of flair to the previous hairstyle start with the same two pony tails only this time wrap the hair from each section around the opposite pony tail Wrap the tail from the top section around the bottom section once and then hold as you wrap the tail from the bottom section around the top. Repeat these processes until you reach the end of the sections and you have an overlapping figure eight like style. Secure each section with bobby pins. Pull a few hair strands from each pony tail and the wound section to create a softer, more romantic look and then set the style with hair spray. Remember, no matter which hair style you choose for your big day in order to get the most enjoyment out of the look you need to practice doing the style for at least three weeks prior to the big day, you need to try out the style for at least five hours in order to determine how the look holds during real activity, and you need to choose a look that makes you feel beautiful but still like yourself. No one wants to be self-conscious on their wedding day.